A FFO: The plaid half-circle skirt. Remember this post? No? I don´t blame you, it´s been over a year. 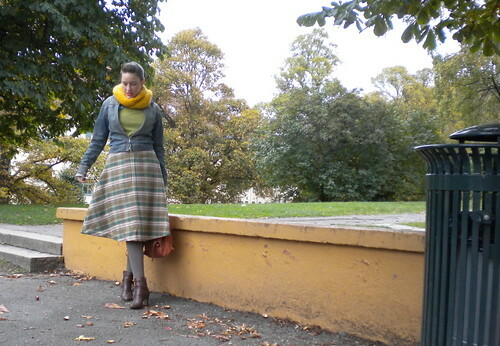 BUT I´ve finally finished my plaid half-circle skirt! That´s why I call it a FFO – a Finally Finished Project. The irony here is that making a circle skirt really doesn´t take a lot of time. But you know, winter came and went, all of a sudden it was summer, and I didn´t really feel the need for a flanell skirt, if you can imagine! 🙂 But now I do, so I sat down a couple of nights last week and stitched together this little number. Nothing really fancy construction wise, just a lining, and pockets in the side seams. I think I placed them a little too low, but they don´t add any bulk this way, so I suppose it´s all good. 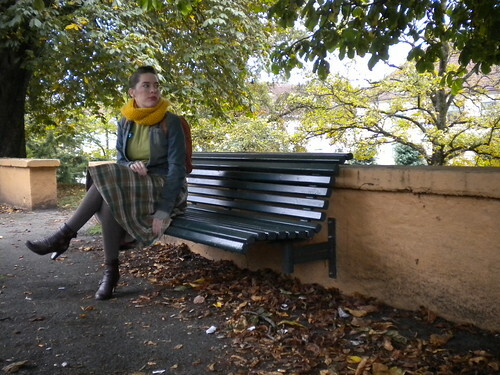 Today is the first day I am wearing it, and it´s so warm and nice – it´s a little like wearing a blanket! The yellow cowl I am wearing is another FO, the pattern is really easy, and with chunky yarn and large needles it really is a very fast knit. Just cast on a 100 stitches or so, and off you go! I knitted it with one strand of a chunky wool, and one in mohair, making it very soft, yet still really warm. I call it Buttercup Fields, after the warm yellow color. I´m guessing it´s gonna be a favorite this winter! This is such a fabulous and warm looking ensemble! Love the plaid skirt and it’s perfect paired with that jacket and stunning cowl! I love the skirt! I need a plaid circle skirt now. You are super stylish solvi, I love how you mix your colours! This skirt looks tops for winter, and I can imagine how snugly it is too. Hurrah!! What a lovely fall outfit! I hope I can find some nice flanell this winter, as wearing a blanket already sounds like a really nice idea – and it looks stylish, too! I really like your cowl, such a nice pop of colour! Thanks, I seem to be prepping for winter these days. You look so cozy, yet sophisticated. I love the pop of color of the cowl around your face.